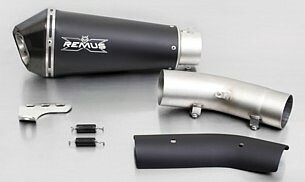 While Pirates Lair specializes in BMWs, we carry the entire line of Austrian-made Remus Motorcycle Exhaust Systems. We obviously do NOT keep the entire product line in stock, but have them drop-shipped from the importer's warehouse in California. We can check availability prior to ordering upon email request. So why should you buy your Remus from Pirates Lair? How about this.. We are consistently voted the I-BMW.com #1 BMW accessory vendor in the US .. and by a wide margin. We're proud of this fact and do not take it for granted. For customer comments.. Click HERE Unlike everyone else, our prices include taxes and shipping in the USA. Having sold many brands of exhausts through the years.. Staintune, Akropovic, Laser, and Two Brothers I can honestly say that Remus is second to none in quality and customer service. I could have anything on my own bike and I choose Remus. Remus provides a 3 year unlimited mileage warranty. 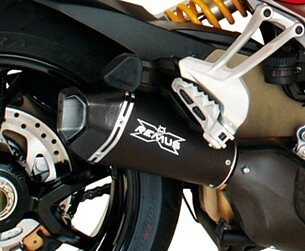 95% of Remus applications feature a silencer/baffle/noise insert. Note: As each Remus vendor agrees with the manufacturer up front to sell at their suggested retail prices, we are all (in theory) on the same playing field. With that said, we will try our best to match any published prices on any Remus system. Can you ask for any more than that? Ordering From Pirates Lair: Our goal is to make ordering from us as painless as possible. If you need information or have questions on any specific kit... email me or call us at 828-628-7093 EST and I'll provide it. If you already know what you want.. either call or email me and tell me which one and I'll send you a paypal bill. Of course we always appreciate it when our customers mail us a check. Payment: We offer 4 methods...1. You can pay via PayPal which is a 100% secure service where you can use your credit cards, debit cards, and even send money directly from your bank account 2. Mail us a check or money order.. .3. We take plastic. AmEx/Visa/Mastercard* 4. Gold doubloons. * Note: There will be a handling/processing fee imposed on ALL phone orders over $750.. This does NOT apply to PayPal purchases or personal checks. FYI.. When price shopping keep in mind that our prices INCLUDE taxes and shipping charges inside the US. Most places DO NOT.